Foil Hat Racing has the top of the line, Dyno Jet dynamometer. This allows us to write the fuel map for your motorcycle in real time as your bike is being run and put under load. The result is a bike that runs at it’s peak for the options you have installed and that your air fuel ratio is a close to optimal as it can be for the selected components you have chosen. Every motorcycle has it’s unique characteristics and we approach each job individually based on your specifications and tuning needs. Weather your motorcycle has a Carburetor or is Fuel Injected Dyno tuning with true air fuel sampling is key. We do not use a cookie cutter approach like many other tuners in the industry but will create a program based on the performance level you want to achieve. 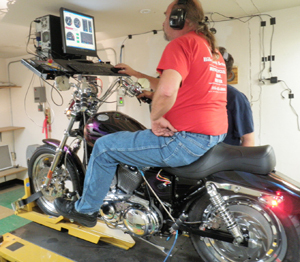 A baseline dyno run will provide you torque, horsepower, RPM and AFR measurements. A baseline run will also allow us to properly diagnose and correct fuel or ignition problems, for your motorcycle and measure the affects of changes or modifications done afterwards. Most customers just want their motorcycles to run correctly after exhaust and air intake modifications. Or they come to us complaining that their motorcycles run way to hot. Working closely with Bikes Built Better any customizing you want will be done professionally and we will tune the bike to the configuration you like best. The dynamometer has also made a huge impact on the racing industry. Most racing teams use a dynamometer to tune their bikes. These days, you are at a disadvantage if you frequent a shop that does not have a Dyno. It has become the industry standard and a shop without one simply cannot provide the state-of-the-art technology and service that a shop with one can.